In our last episode, we left our heroine at a crossroads … WOULD HER CONFAB PROPOSAL BE ACCEPTED? Are you interested in content strategy? (Um, you should be!) Make it a point to attend a Confab conference. You’ll be glad you did. I had the opportunity to volunteer at Confab Higher Ed, a content strategy conference focusing on (you guessed it) higher education, when it took place in Indianapolis last November. You can find some observations about Confab Higher Ed 2017 from me and others on the IU Libraries DUX department blog but I thought I’d add a few more thoughts that have distilled over time. As a volunteer, I was partnered with another volunteer and assigned to a particular room for a period of time, where we would distribute and collect evaluations, introduce the speaker and make sure they had what they needed, manage the microphone for Q&A, record attendance numbers, and sometimes help out with other small A/V tasks – or anything else that needed doing. As it turns out, the Confab Events team is shaking things up a bit and streamlining to one Confab event (annually in the spring) so I was especially grateful to have been able to experience the very last Confab Higher Ed. 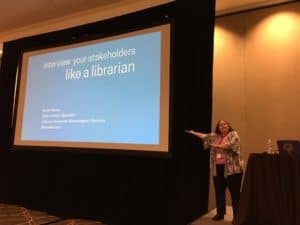 Sadly for me, I wasn’t assigned to the room where my colleague and friend Anne Haines gave her talk, “Interview Your Stakeholders Like A Librarian” (slides) – but I did get a minute to run over and document it. Because I had a lot of things to focus on during the sessions, I did take some notes, but in some cases it was easier to tweet (hence the embedded tweets below.) The room to which I was assigned for the preconference hosted Mike Powers for the morning session; his workshop was on analytics, measurement, and improving your content. He said a lot of things that really hit home, but one of them spurred me to meme-dom. Robin Smail, in her talk “The Accessible User Experience,” dropped this truth bomb about accessibility misconceptions. As a fellow Drupal user, I was super pumped to be volunteering in the room where Kelly Davenport & Jackie Wolf of Michigan Medicine, gave the talk “How Do You Go from Good to Great? A Case Study on Redesigning the University of Michigan Medical School Website,” talking about their migration to Drupal 8 and how they were able to empower their content editors to make the site more useful and flexible. 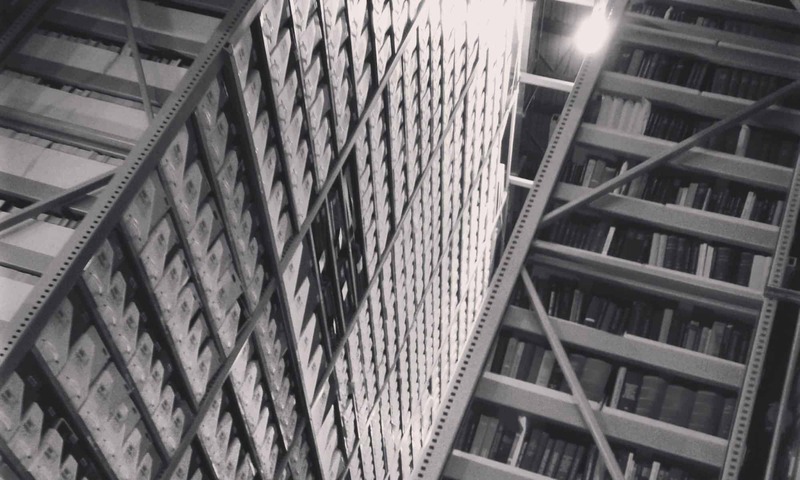 One of the main techniques they employed was to make use of the Drupal Paragraphs module – something I was able to go home and immediately put to use as part of the Drupal 8 migration we were just kicking off at IU Libraries at the time. At IU Libraries, we worked with our awesome partners at Bluespark who developed an IU-customized Paragraphs module, which we put to great use in the new site to enable us to be both flexible and on-brand. (One early example: Student Jobs page) You can read a little more about this in the Bluespark article. Finally, the team from Brain Traffic are just such lovely, interesting, smart, hard-working, fun people. From the pre-conference hours at the registration desk and in the workshop rooms throughout the two days of conference following, they were, without fail, kind, helpful, and always ready with an apt witticism – and/or a snack. Volunteering is work – that’s why it helps! – but it was also a really good time. I had an opportunity to observe first-hand their commitment to making the conference experience excellent for every single attendee. It made my service-oriented, user experience, librarian heart glow; and it gave me a lot of ideas about how to manage the details on any conference or event I will plan in the future. In fact, they are so awesome I finally put on my big-girl pants and submitted a proposal for Confab 2019. If it’s accepted, that will be the literal icing on the cake – cake is a big deal at Confab – but regardless, it feels like an accomplishment. It’s been an exciting but somewhat turbulent year, and like many others, I’m no stranger to impostor syndrome, to wondering whether I have anything worth sharing, to crippling writer’s block. Thinking of the wonderfully supportive Confab team, and of the warm and accepting conference community they’ve created, helped me keep pushing forward. It may only be a proposal, but it also marks the end of a stuck place. Earlier this year, Jim Hahn & I published an article, “Account-based recommenders in open discovery environments” in Digital Library Perspectives – it is of course findable through the publisher’s site via https://doi.org/10.1108/DLP-07-2017-0022, but it’s also openly available through both the Indiana U and U of Illinois open repository sites. Since this is my blog, I’m going to point you to my copy of the article 😃 – available via IU Scholarworks Open. … In the age of big data and machine learning, advances in deep learning technology and data stream processing make it possible to leverage discovery system data to inform the development of personalized recommendations. I’ve been acquainted with Jim since my I-Share days, and he’s been a marvelous colleague and a great collaborator, in addition to being super smart. If our article is of interest, do definitely take the time to read about the cool stuff he and his team have done with Minrva. Furthermore, I want to acknowledge the assistance and advice of Naz Pantaloni, Copyright Program Librarian. He generously gave of his time and expertise to help me as I worked with the publisher to negotiate rights. As a direct result of his support, we were able to retain full rights to our article – which is why I am able to openly share it today and in perpetuity. Thanks, Naz! Plenty has transpired since my last post in March 2017, but I’ll skip to the biggest news. This spring, my husband Robert McDonald was named the Dean of Libraries at the University of Colorado Boulder – exciting and happy news to be sure, but news that required us to pack our things and say our goodbyes to our wonderful colleagues at the Indiana University Bloomington Libraries. This new chapter follows on, as all new chapters do, with the closing of the previous one. I can’t say enough about the eight years I spent at the IUB Libraries, so I’ll just be brief and say: Thanks for everything! We had a great run. I’m proud of what we accomplished together. I may even circle back and write about some of our projects, like our migration to Drupal 8 (which occurred my penultimate day in the office! Way to go out with a bang! 🔥). Earlier this month, I joined the library faculty at the University of Colorado Boulder Libraries as the Learner Experience & Engagement Librarian. In my new role, I’ll continue my focus on user experience & user research, which will inform (among other things) the development of programming for our Norlin Commons. As ever, I’m glad to be working in the service of enhancing student learning and engagement as part of a learner-centered library community. Many thanks to my new colleagues at CU Boulder  for being so warm and welcoming. I look forward to the adventures we’ll have together. Yes, it really is CU, even though it’s the University of Colorado. But if you mess up, you’re in distinguished company. I wrote a post on Thursday titled ACRL2017 – Day Zero, implying to myself and you that I would be posting daily updates from the conference. HAHAHAHA. It’s always good to aspire, right? 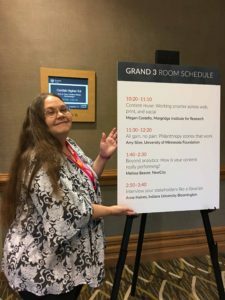 This was my ninth ACRL – yes, ninth – and I was giving some thought to that over the course of the conference. I’m 17 years into this library adventure and I reckon that’s just a little bit less than halfway through, assuming I don’t win the lottery or have a life-changing encounter and open that goat farm that’s previously been my post-apocalyptic Plan B, or whatever. What kind of world will we be living in? Where will libraries be at that time? Where will I be? What choices should I be making now that I’ll be happy with in 20 years? These are some of the questions that were in the back of my mind as I experienced the conference. Greetings from Baltimore, where I and a record-attendance-crowd of around 3400 academic librarians have gathered for the 2017 ACRL Conference. I always look forward to this biennial event not just for the session content but also (obviously) for the opportunity to reconnect with friends and former colleagues, and to meet new folks. And for the eating, naturally. Baltimore is off to a strong start there – last night we enjoyed a marvelous dinner at Woodberry Kitchen with dear friend Peter. I enjoyed it so much I really didn’t take any photos (once we got going anyway…). Beautiful space in an old mill, especially resonant for my husband who grew up in a mill town. Even in a large city, ACRL-time is a pretty high concentration of faces you know, so there are all sorts of wonderful moments where you look up to see a pod of dear friends also crossing the same footbridge. Making things beautiful, efficient, informative, and clear is worthwhile and it does make a difference. I will have more takeaways from the talk, obviously, as I have time to process further, but that’s what I was thinking about this morning. Check out the visualizations online at Information Is Beautiful. It was a great start to the conference! My Thursday schedule includes a paper on library bathrooms so watch for tomorrow’s report. In this extremely late – as in, almost six months in draft late – latest update from your humble correspondent, this seasonal migratory web librarian chronicles her travel to Sioux Falls, South Dakota to attend the Now What? Conference (April 13-14). First, let’s get this out of the way: anytime I can participate in a fantastic learning opportunity, enjoying talks by industry leaders in a nicely-sized conference community held in a cute town IN A STATE I’VE NEVER YET VISITED, I call that a win. In case you’re wondering, I checked off State #38 (my apologies to Wyoming, I forgot it when I did my pre-trip calculation, so that’s one more inaccuracy on Facebook). Now What? Conference is two days of talks and workshops about how to maintain and improve your website. It’s not just about making a new site – it’s about getting better at handling your current one. Join us and our team of experienced web-hands to navigate the high seas of website maintenance – from writing great copy to tracking content effectiveness – and ensure that you have what you need for smooth sailing. So, off I went to South Dakota. 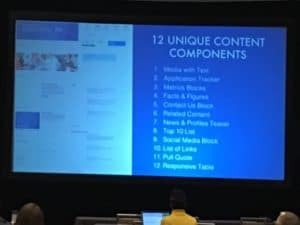 I had a commitment to teach on the Wednesday morning, so I had to miss Meghan Casey’s Content Strategy workshop, but in the afternoon I attended Rebekah Cancino’s workshop on content management and governance. I took so many notes! So many good ideas. In fact, the reason this post sat in my draft folder for nearly six months was the sheer volume of notes and insights from the half-day workshop & single day of talks. I kept thinking, I’ll go back and write them up in more depth. And then it was time to grade projects. ALA came around. My dossier was due. I gave a couple talks. The semester started. Now it’s October – nearly November! Oh man. Jonathan Colman gave a great keynote, Wicked Ambiguity and User Experience, which has had me thinking about wicked problems and beautiful solutions ever since. Each one of the talks was so on-point: Ron Bronson, Misty Weaver, Matt Grocki, Megan Costello, Rebekah Cancino, Kevin Hoffman. For now, just read the blurbs. In addition to giving great talks, they were also just the coolest people – I wound up getting to have dinner with a number of the speakers (fun!) and so enjoyed hanging out and talking. The folks at Blend Interactive who organized the conference were similarly awesome; and as previously mentioned, Sioux Falls is a delight. And we’re back for the exciting conclusion of “#libux Awesomeness in Austin!” In our last episode, I focused on ER&L, which took place Sunday April 3 – Wednesday April 6. 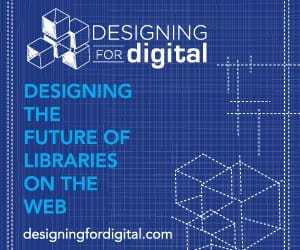 Overlapping a bit with ER&L is its sister event, Designing for Digital: Designing the Future of Libraries on the Web (or, D4D for short). I attended D4D last year, and you can find my writeup on the 2015 event on the DLF blog. Since the Bloom’s Taxonomy of conference needs had been achieved and we were amply connected, caffeinated, and comfortably fed (more on this later), we were all able to attend to the work at hand – which was to choose from a number of workshop options and sessions, all focused on user experience. I’ve heard ALA Annual compared to “brigadoon for libraries” (pretty sure @shifted was at the bottom of that one! whoever it was: thumbs up!) – this was like “brigadoon for #libux.” A magical place appeared, and oh-so-briefly, my Twitter timeline manifested itself in the flesh in front of the breakfast buffet, in the conference seating, and (later) in line at the bar. It was magical. No, seriously! Fantastic to get a chance to chat, discuss and just hang out in person. The internet is great as a long distance connector, but something about facetime is really special and makes the time and investment in conference attendance worthwhile. I opted to attend the session track rather than choosing any of the workshops – although the buzz on the workshops was very good, this year I felt like I wanted to try and see as many speakers as possible during the two-day intensive experience. You can see all the session information online at https://d4d2016.sched.org. Also, don’t miss this conference roundup complete with visual notes from Melanie Parlette-Stewart: beautiful! As with last year, the conference keynotes were amazing: Jesse James Garrett (@jjg) and Michelle Ha Tucker (@michellecyha). Both of these talks are still available via the recording of the livestream. Watch them. Really, really watch them. Wayfinding is something we need to talk about more in libraries! Integrating cues that help people navigate a space, virtual or physical, is so key; I’m glad we’ve started discussing this more broadly. Beth @filarwilliams dropped some great knowledge about wayfinding as a concept, a nifty modded-out podium that became a concierge station, and the importance of involving staff from top to bottom in user outreach. So, um, they just want it to work. It’s a tool for them. Search first, ask questions later. Two words for you: Generous Interfaces. I never thought of keyword searches as stingy before, but this has been blowing my mind ever since. The article she mentioned was Generous Interfaces for Digital Cultural Collections – and now I’m finding lots more to read on the topic as well (oh boy!). But, there was so much more good stuff about @wellcomelibrary projects from Jennifer Phillips-Bacher (@MrsAudiac) that you should read the deck for yourself. Again, look at the deck. and 400 belong to just one person. I want to be sure to say that, in addition to being great conferences for legitimate business and professional development reasons like programming and networking, it’s also a huge plus that ER&L/D4D are held in Austin, TX at the fantabulous AT&T Executive Education Center on the UT-Austin campus. You really feel tied into the energy of the Austin web/design community and of the UT campus, not to mention that the venue itself is really nice. During our visit, the weather was lovely and I had more chance to explore the campus and areas around than on our last visit, including Torchy’s Tacos [you need to know about the secret menu]. Oh, and did I mention the amenities – by which of course I mean wi-fi, coffee and conference meals/snacks? Thanks to all the attendees and presenters! So many good conversations – very insights! Much learning! So wow! If you work in #libux, put this on your travel plan for next year. I’ll look forward to seeing you there! The first week of April, Robert and I attended Electronic Resources & Libraries (ER&L) and Designing for Digital in Austin. We returned with our brains full of ideas and our tummies full of tacos – so it was a successful week on all counts. In fact, as I’m writing this up, I realized that it needs to be broken into two bite-size chunks, so this first post will cover ER&L and I’ll follow up tomorrow with a post on D4D. ER&L kicked off with a thought-provoking, fantastic keynote by Dr. Dawna Ballard (@dawnaballard), Associate Professor in the Moody College of Communication at The University of Texas at Austin. Shes an expert in chronemics. What’s chronemics, you might be asking? Watch the archived livestream of her talk “Finding Time: From Industrial Mythology to Chronemic Literacy,” which (good news) is still available via the ER&L site at http://sched.co/5ZPJ. The big ideas I took home from this talk were around how we experience time personally, organizationally, culturally – and how time functions as an agent of societal structure (which changes over time, by the way). She contrasted the idea of chronos – time by the clock, a conceptualization which came into primacy with the industrial revolution – with the idea of kairos where time is event-driven, a pre- and post-industrial concept (harvest time doesn’t look at a calendar or a clock, for example). She broke down some myths about time and time management, then got us all pumped up about seeking mindful alignment in our lives rather than chasing work-life balance. Balance and motion aren’t simultaneously attainable or sustainable – as she pointed out, that yoga person in tree pose? Not moving. I should have done a quick Storify before the conference stream went cray-cray because so much was captured in the tweets – and it was really interesting and actually encouraging to see how much this spoke to the audience. The folks at LSU Libraries have compiled a list of texts used in courses and are cross-referencing that against another compiled list of e-book holdings; from this, they’ve created a really user-friendly search, focused on end-user impact, and are re-framing e-books/e-texts questions proactively in terms of the library and library collections. Check out the student interface for the e-book service. Increasing communication and clarity around organizational strategy so that employees not only know and understand it, but can act on it. Let me also point you to two great sessions by fellow Indiana library school alums – Stacy Konkiel on “Altmetrics in Practice: Librarian and LIS Faculty Views” [slides linked from session description], and Galadriel Chilton on “Using the Scrum Project Management Methodology to Create a Comprehensive Collection Assessment Framework” [slides linked from session description]. Finally, gotta give a shout out to my husband’s panel, “The Role of Choice in the Future of Discovery Evaluations,” [slides linked from session description] where in addition to some helpful background on the development of the discovery interface in the ILS market and good thoughts about interoperability and data portability, there was also a slide about cheese, giving us a new (and in my case extremely personally compelling) way to think about what happens to user experience when we make those ‘good enough’ choices. Beyond the great content, the sense of community at ER&L is fantastic – not only did I get to connect with so many folks already in my network, but also had a chance to meet new folks and talk about shared challenges, new ideas, and of course the best places to get tacos in Austin. I wasn’t able to attend the closing keynote as it conflicted with the opening keynote for Designing for Digital … but more on that later.